As promised, here are the slides from my talk at Impact Product Management Conference 2018 event in Budapest, Hungary. The empathic component is what makes a product manager special. In a field that values objective performance, spending your time on empathic interaction is perceived as a waste of time because is not measurable. But there is a connection between empathy and other outcomes, such as enhanced team buy-in, smoother communication and information exchange. Empathy is key to building great products. Give it to your office community, and they will love you. In some organizations, the strategy/decision making (roadmap) happens without product management. Organizations don’t always wants product managers to align product (or technology) initiatives with the business strategy. Instead, decisions are done by executives or a different function like sales and marketing. As a Product Manager you are then asked to plan timing, align resources and direct the engineering team to execute. Yeah! That’s project management. So how do you ensure that both digital leaders and non-digital leaders are making good decisions about the company’s product efforts? In any company, you will have to work with people who want different things. Everyone has ideas, after all. Most inventive ideas end up being diluted beyond recognition, killed outright, or crushed under the weight of the company. Given how many people are involved in an organization — with emotions, egos, unique styles, and different goals — the human element of any business makes building things hard. At times, that requires a lot of diplomacy and emotional agility. These are your constraints. This is the world within which you must work. So how do you create consensus? Be a good listener. Encourage them to talk about their product ideas. Talk in term of their interests, let them feel that the idea is theirs and use it to firm up your roadmap. Soft skills are what separates great product leaders from mediocre product leaders. Empathy improves your relations with people. We have no power to make other people see things as we do. You aren’t going to win every battle. Leadership is going to be wrong sometimes. Engineers will estimate wrongly. And Sales will always promise things your product doesn’t and will never do. And because you work at the intersection of groups of people — often people from different backgrounds — there will be very little shared understanding. Empathy is a facilitator for communicating what you’re trying to achieve and moving together as a team. Why does the contribution of others play such a big part in the product process? People need to buy into your vision. No buy-in equals no delivery which ultimately means unsuccessful products. A key ingredient in successful product management is team-building by creating mutual support. No buy-in equals no delivery which ultimately means unsuccessful products. Great products are built by teams with a huge conviction for what matters to their customers; and who are prepared to move seemingly unmovable barriers to achieve customer goals. So how do you best interact and work with others so to build meaningful work relationships? Involve others in the solution finding process. To some extent building a strong product organization is all about building a culture which encourages coordination and soliciting of well-represented opinions and feedback from a group with diverse perspectives to reach a common, best solution. What and How questions allow you to improve your relations with people. What’s your story? Connect the dots for me. What information do you have that I don’t? What are you noticing so far? What happened, from your point of view? I’d like to give my reaction to what you’ve said so far and see what you think. Why is that/ do you feel that way? Can you tell me what specific issues you need help with? Regardless of the outcome of this issue, how can you grow and learn from it? How will you most likely view this situation in six months? What would the other person in this conflict say? How might that be true? I have a completely different perspective, so how can we fix this? How is blaming me going to improve anything? Let's figure a way for us to get along. Give attention to the unspoken cues and develop cognitive or emotional empathy of other people’s situation and perspective. Often times, we are too busy thinking about ourselves and what we are saying, and we leave little room to watch and understand others’ actions and intentions. If you misinterpret others’ intention or don’t try to put yourself in their shoes, you can easily encounter difficulties dealing with people and not even know why. Every team member has their own opinion and sometimes productive disagreements arise. I like to embrace discourse because it helps bring issues to the surface and allows me to build a better product. Effectively build trust, find common ground, have emotional empathy, and ultimately build good relationships with people at work and in your network. Coordinate and solicit well-represented opinions and feedback. There are specific problems, benefits, or situations the roadmap has to address. Don't own or be its communicator. It's subject to high failure rates due to team members not being motivated to succeed because they didn’t get picked or don’t like the way it was decided. Facilitate, coordinate and solicit well-represented opinions and feedback to reach a common, best solution. Influence perspectives but still have the people you influence think they made up their own minds. The one attribute always mentioned as necessary to being a good physician is being a good listener. When a patient feels that a physician understands his condition and apprehensions, he feels more comfortable confiding in him/her. This heightens the quality of shared information. When combined with factual information about the patient the physician stands a far better chance of treating them and illness effectively. The stethoscope is an icon, of course. The instrument may have outlived its use, but it hasn’t lost its power. An opportunity to create a bond between doctor and patient. It narrows the physical distance. It compels human touch. Win-win resolution that you find favorably, satisfies both sides, and maintains relationships for future interactions. As a PM, you’re often best positioned in the company to learn about product ideas from your coworkers. By knowing how to effectively communicate your product roadmap you can set expectations while at the same time encouraging idea generation throughout the company. Are we still aligned? Do you need anything from me? Building buy-in to an idea, a decision, an action, a product, or a service. This is not just for people in sales. Patients can’t trust a doctor who won’t touch them. Your office community (executives, sales, or engineering teams, etc.) won’t trust you if you don’t listen to them. Go ahead and repeat your strategy, give people the information they need and fine-tune. Repetition promotes alignment among diverse groups within your organization, clarifies objectives and priorities, and helps focus efforts around them. 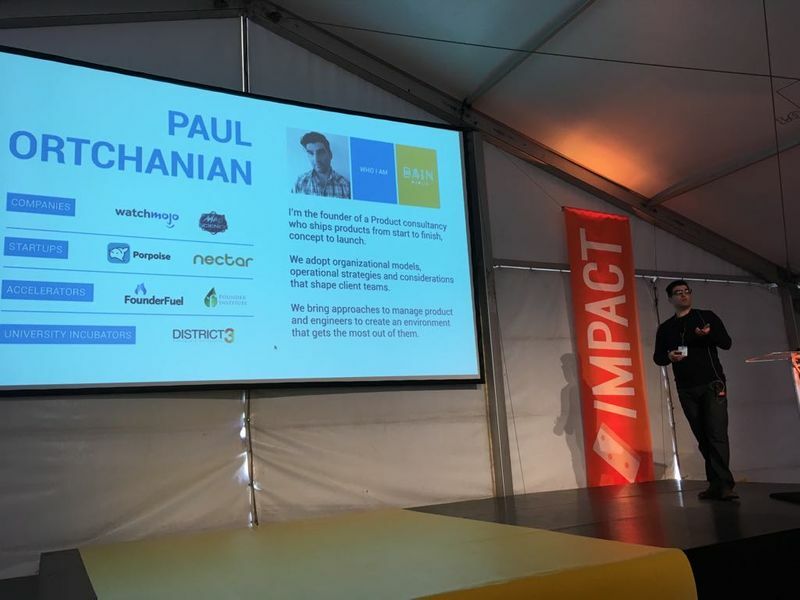 Thanks to Impact Conference 2018, Budapest, Hungary for letting me present my principles on Product Management. Also, if you have any feedback or criticism about this article then shoot me an email.